(Last Updated : 16.04.19). 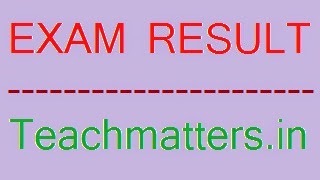 Check latest DSSSB Result & Cut-off Marks of Primary Teacher 2019 Recruitment under MCD. PRT Result 2019 Cut-off Marks for post code 01/18, 16/17 and 70/09 can be checked here. DSSSB PRT Written Exam for post code 16/17 conducted on 29.10.2017 was Canceled and was held as afresh on 30 September & 13, 14, 28 October 2018. TIER-1 Result has been declared after the publication of the official answer key of Primary Teacher Exam 2018. Official and final answer keys of PRT Post Code 01/18 and 16/17 was released on the official website. Check here DSSSB Primary Teacher Result 2019 Cut off Marks List for MCD PRT Teacher. Check latest result of MCD Primary Teacher Recruitment 2018-19 for various post codes. Candidates who are appearing in PRT Written Exam 2018 for Primary Teacher Post Code 16/17 can check here latest result, cut-off marks of previous years examinations. Here is DSSSB PRT Result and Cut-off Marks Merit List 2019. DSSSB Primary Teacher 16/17 : Result & Cut-off Marks - DSSSB PRT Tier-1 exam was held on 29.10.2017 and was canceled on 27.12.2017. PRT Re-Exam 2018 was held on 30 September 2018 & 13, 14, 28 October 2018. The Result and Cut-off Marks List of Primary Teacher Exam 2018 can be checked here as the result is declared on the official website of DSSSB. DSSSB MCD Primary Teacher Post Code 70/09 Result 2017 latest updates is available here with revised result and cut off marks list of selected candidates. DSSSB uploaded Revised Result of Primary Teacher post code 70/09 on 21.05.2018. The board uploaded the list of 01 provisionally selected candidates in continuation of previous Result Notices for the post of Primary Teacher (MCD) under post code 70/09. DSSSB PRT Result was declared on 05.12.2014 and further revised through various result notices. See here revised result and list of selected, pending and rejected candidates for the post of Teacher (Primary) post code 70/09. DSSSB uploaded list of 01 selected candidates for the above said posts through result notice no. 599 on 21.05.2018. DSSSB uploaded list of 01 rejected candidates for the above said posts through result notice no. 542 on 05.05.2017. DSSSB uploaded list of 30 provisional selected candidates for the above said posts through result notice no. 541 on 03.05.2017. DSSSB uploaded list of 13 provisional selected candidates for the above said posts through result notice no. 460 on 07.04.2016. DSSSB uploaded list of 31 rejected candidates through notice no 461 on 07.04.2016. Their candidature for the post of Primary Teacher has been canceled due to various reasons shown against their names in remarks column. DSSSB uploaded list of 59 selected candidates and list of 42 pending candidates. Pending candidates are directed by DSSSB to appear for submission and verification of documents on 02.02.2016 at 11.00 A.M. to 4.00 P.M.
DSSSB uploaded list of 26 rejected candidates. Their candidature for the post of Primary Teacher has been canceled due to various reasons shown against their names in remarks column. DSSSB (on 16.02.2016) directed the following candidates to appear on 24.02.2016 at 11.00 A.M. at the Board's Office for document verification. Here is the detail. In view of Order dated 11.08.2015 of Hon'ble CAT and the decision taken in the board's Meeting held on 04.11.2015, DSSSB on 05.11.2015 rejected the candidature of the candidates of the post code 70/09 Teacher (Primary) who were petitioners in the OA. These candidates were allowed to include in the recruitment by the Court's order as they were not eligible on 15.01.2010 as cut-off date for determining the eligibility for the above said post of Primary Teacher. Here is the detail. DSSSB on 23.07.2015 uploaded court cases result and marks list of 181 pending candidates for the post of Primary Teachers Post Code 70/09 in SDMC. Before this, DSSSB declared the Marks List of Pending candidates whose marks were kept in a sealed cover. DSSSB uploaded list of selected candidates and their allotted region for the post of Primary Teacher Post Code 70/09 in SDMC on 10.07.15. DSSSB further (on 16.04.15) revised the Result of Primary Teacher Post Code 70/09. DSSSB released the list of 502 candidates as provisionally selected and 26 candidates as rejected/not eligible due to various reasons. DSSSB has further revised the result of Primary Teacher, post code 70/09 in MCD on the basis of written examination held on 02-02-2014 and eligibility regarding educational qualifications, age etc. as per Advertisement No. 004/09. The DSSSB has declared 502 candidates as provisionally selected and recommended for appointment to the post of Teacher (Primary), post code 70/09 in MCD. This is subject to outcome of Court cases/CAT cases pending in respect of this post code. Earlier DSSSB declared 2676 Candidates as provisionally selected. On the basis of the above details and further verification of documents by the staff of MCD, DSSSB has also declared 26 candidates as “Not Eligible” and their candidature for the post of Teacher (Primary), Post code 70/09 is hereby rejected due to various reasons which are shown against their names in remarks Column. Also, the candidature of those candidates who have obtained less than minimum qualifying marks in their respective categories is also hereby rejected. This is subject to outcome of Court cases/CAT cases pending in respect of this post code. Earlier DSSSB had declared 1500 candidates as "Not Eligible/Rejected" for the same post. department. The Hon’ble High Court of Delhi vide judgement dated 06/02/2013 in WP(C) 3397/2012 titled as DSSSB V/s. Preeti Balyan ordered that the cut off date would be 15-01-2010 for the post code 70/09. Therefore, in compliance of the judgement of Hon’ble High Court of Delhi, the candidature of those candidates, who had not completed their eligibility criteria as on 15-01-2010, have been rejected. The DSSSB had declared the Result of Primary Teacher in MCD whose exam was conducted on 02.02.2014 for post code 70/09. DSSSB notified the marks obtained by the candidates in this exam in ANNEXURE-I enclosed with the result. The mark list of 168 candidates who were provisionally allowed to appear in the written examination held on 02.02.2014 as per direction of Hon’ble Delhi High Court/CAT were kept in sealed cover and were not to be declared without leave of Hon’ble Delhi High Court/CAT. On 13.01.2015, DSSSB declared the Marks List of 144 candidates whose result was previously declared pending. On 27.02.2015, DSSSB declared the Marks List of 12 candidates whose result was previously declared pending. The OMR answer sheet of 38 candidates have not been evaluated and have been awarded Zero marks as there are discrepancies noticed in their OMR answer sheets as mentioned in the remarks column (ANNEXURE-II). The marks obtained by 05 candidates appeared at Roll Nos. 07084970, 07092225, 07065866, 07092331 and 07092352 have been withheld pending further enquiry. As per final answer key uploaded on the Board’s website on dated 04-03-2014, the total number of maximum marks shall be 198 instead of 200 for this examination. 1. O.A No. 703/2014 M.S 595/2014 Sareen Dabas & Ors Vs. GNCTD& Ors. 2. O.A No. 774/2014 Monika Sharma Vs. GNCTD & Ors. 6. O.A No. 1328/2014 Manjeet Singh & Ors. Vs. GNCTD & Ors. The mark list uploaded on the website does not entitle any candidate for the selection and the result of this post shall be declared only after determining the eligibility of candidates according to RRs mentioned in the Advertisement.